Large quilted shoulder bag with front,side and inside pockets and optional zippered top. 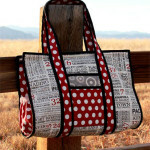 Size: 17″x12″x6″ A beautiful bag with plenty of pockets. A beautiful bag with plenty of pockets.